Hartsfield-Jackson Atlanta Intl. - Los Angeles Intl. Dallas-Fort Worth Intl. - Los Angeles Intl. Love Field - Los Angeles Intl. John F. Kennedy Intl. - Los Angeles Intl. Liberty Intl. - Los Angeles Intl. If glitz, glamor, and gorgeous scenery speak to you, a trip to this city is everything you could ask for. Vacations in Los Angeles, California, open the doors to an inspiring and magical place with an energy that's palpable from the moment you arrive. From Universal Studios to the Huntington Library and all the way to Venice Beach, the City of Angels is unlike anywhere else. So, whether you're viewing the landscape from the impressive J. Paul Getty Museum or having barbecue in Koreatown, you'll feel the city's wonderful vibe. Ride it like a wave, wise wanderer, and let one of our Los Angeles vacations pull you in for good. 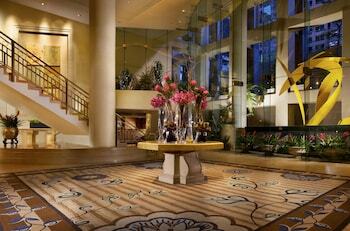 Hilton Los Angeles Airport: If convenience is what you seek, the Hilton might be perfect for you. Located less than half a mile from LAX, this huge hotel is also close to the city’s convention center and many other attractions. The modern guestrooms here include marble accents and handcrafted beds, as well as high-definition televisions and desks in case you need to work. The on-site Italian restaurant ensures you won’t have to go far for a bite to eat, and the Hilton’s fitness center and heated outdoor pool can help keep your body toned and relaxed. 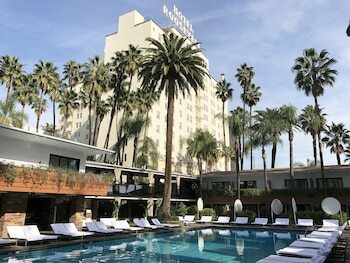 Loews Hollywood Hotel: Just steps from Hollywood’s Walk of Fame and the city’s famous Chinese Theatre, this ritzy hotel is home to elegant rooms with finely appointed furnishings. A few quarters here provide views of LA’s skyline, while others offer glimpses of the Hollywood Hills. 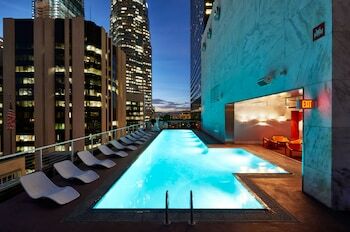 Suites are available for those searching for some extra space, while the heated outdoor pool presents the perfect way to unwind after a long day. 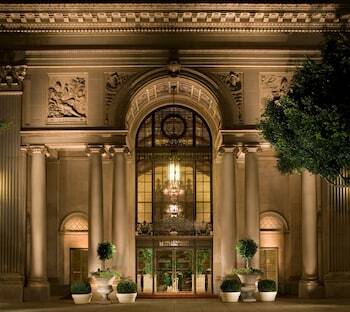 You’ll also find a hip restaurant and fully stocked cocktail bar at the luxurious Loews. 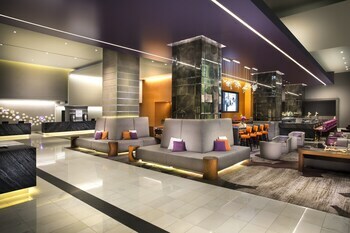 Four Points by Sheraton Los Angeles International Airport: Within 1 mile of LAX and less than 12 miles from the Santa Monica Pier and LA’s Museum of Art, this practical hotel might not be as flashy as some of the city’s other accommodation, but you’ve always appreciated simplicity. Upgraded suites with sofabeds are available, and the Four Points has a sports bar, restaurant, and coffee shop on-site to quench your thirst or please your palate. 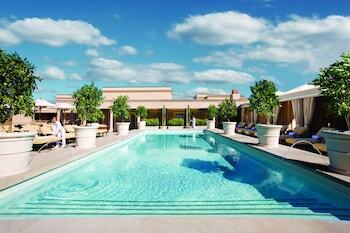 There’s also an always-open exercise center at the hotel, and a heated outdoor pool offering wonderful views. 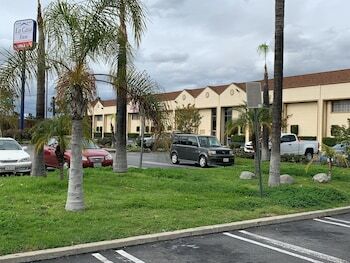 Fairfield Inn & Suites Los Angeles LAX/El Segundo: If you’re seeking contemporary accommodations not far from the airport, look no further than the Fairfield Inn. By serving complimentary meals each morning and providing guests with free internet access throughout the day, this hotel is easy to love. Shuttle service is also available for no extra charge, and the fully featured fitness room is another nice touch. The hotels included with some Los Angeles package deals are so nice that you may not want to leave, but one trip to the vibrant Venice Beach will keep you out for good. If you love beaches and delicious food, the Santa Monica Pier is also worth a stop. 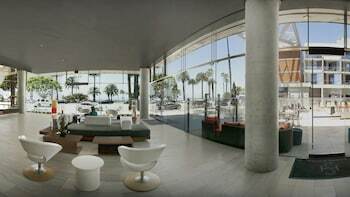 Malibu Beach, meanwhile, is a surfer's delight, while Rodeo Drive is a fashion enthusiast's dream. If you want to imagine what it would it's like to be rich and famous, go and walk around Beverly Hills. To see a real celebrity, however, head over to Hollywood Boulevard, then stay for all of its great bars and eateries. If you can find a deal on car rentals in LA, you should cruise along Mulholland Drive and soak up the scenery. Finally, Downtown LA has plenty of architectural masterpieces, such as the Walt Disney© Concert Hall, as well as sports games, including Dodgers baseball and Lakers basketball. As you look for vacation packages in LA, the list of notable festivals and events in LA is almost endless, but the following should not be missed: the Los Angeles Marathon in February, the LA Gay Pride in June, Independence Day celebrations in July, Nisei Week Japanese Festival in August, the LA County Fair in September, and Day of the Dead (Dia de Los Muertos) in the beginning of November. 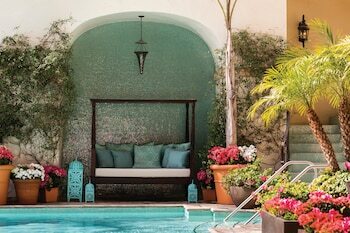 Travelocity makes it easier than ever to find a cheap vacation in Los Angeles in just minutes. Check out our selection of deals today, and you’ll be on your way to this famous city before you know it. Need insider tips on must-see attractions in Los Angeles? 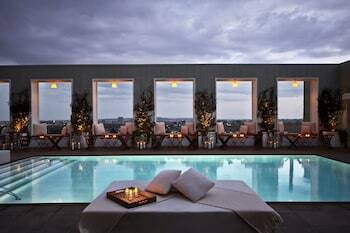 Check out our Los Angeles travel guide! The city of Burbank, just 12 miles from Los Angeles, enjoys a Mediterranean climate that make Burbank vacations enjoyable any time of year. Nestled in the Verdugo Mountains, you'll find the city to be a delightful meld of outdoor spaces and avant-garde architecture seasoned with the flair of nearby Hollywood. The quiet town of Baldwin Park, California, is a great spot for spending a relaxing weekend, but it's also conveniently located half an hour from the hustle and bustle of Los Angeles, This gives you a choice: quick, easy access to the big-city attractions, or a peaceful day in, depending on your mood. 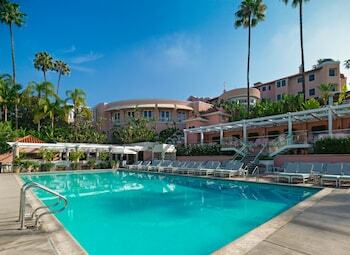 Let Travelocity's Baldwin Park vacation packages take you there. A stone's throw from the bustling hub of Los Angeles lies the charming community of Hawthorne. Hawthorne affords easy, quick access to all that Southern California offers: culture, sports, entertainment, mountains, and beaches. Temperatures in the area are always among the most pleasant in the Los Angeles basin, so with a beautiful year-round Southern California climate, any time of the year is a good time for Hawthorne vacations. If it's surf, sand, and sea you're after, wax up a board and paddle out for another beautiful California sunset before hitting some of the finest eateries California has to offer. What's your California dream? Is it to visit Hollywood or to see the blue waters of the Pacific? Maybe you dream of watching your favorite sports team or want to visit a thrilling theme park. Whatever your dream California destinations happen to be, planning a Downey vacation puts you in a central location that's convenient to all of them. Southeast of Los Angeles and bordering Orange County, Downey is in the center of everything Southern California has to offer. A trip to Inglewood in Southern California can be filled with music, beaches, and a little bit of soul. 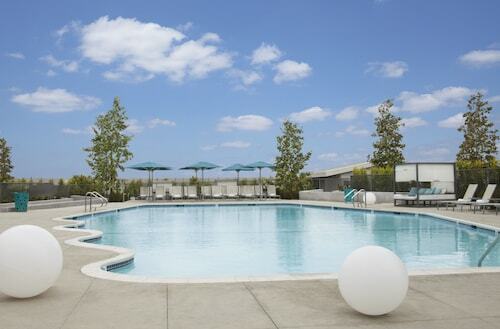 Book one of Travelocity's budget-friendly Inglewood vacation packages and grab your shades, because the sun is almost always shining here. And with the money you saved on the package deal, you can afford to roll the dice on a little casino time before dipping your toes in the sand. The longstanding city of La Puente, CA, is a unique spot in Los Angeles County. There are parks for relaxing and learning about nature, as well as businesses that provide different types of recreation. La Puente vacations are conveniently located near other great California towns and cities. Visitors can book package deals to La Puente and put their budgets at ease. Monrovia, a city in the foothills of the San Gabriel Mountains of Southern California, is one of the oldest cities in Los Angeles County. With seven parks and a wilderness preserve, Monrovia vacations are a good choice for families and anyone who enjoys spending time outdoors. Plus, with Monrovia car rentals, you can experience some of the city's history by taking a drive along Route 66 (now Huntington Drive). Norwalk, a suburb of Los Angeles, is a bustling town full of fun places to do and see. With plenty of nightlife, live music, and natural areas to explore, vacations in Norwalk are a perfect way to explore everything that the Southern California region has to offer. With so many Norwalk hotels to choose from, this suburb is a perfect jumping-off point for the rest of the region. Only 20 miles south of Los Angeles in the midst of Southern California's South Bay sits the city of Torrance. 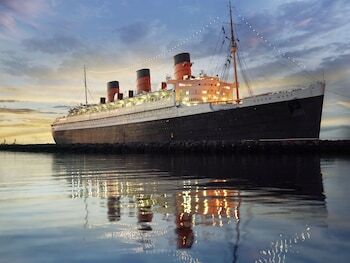 Visitors love experiencing everything here, from the pristine beach to the exciting exhibits honoring Torrance's historic role in the aerospace industry. Book one of the centrally located Torrance hotels through Travelocity and get ready to explore a world full of delicious Asian-inspired cooking, craft beer, and California sunshine. Come enjoy fresh fruit right off the vine in Pomona, California. Named for the ancient Roman goddess of fruit, Pomona is known as the "Queen of the Citrus Belt." The city is located in the sun-drenched Pomona Valley, where fruit trees hang rich with luscious fruit practically all year round. Check out car rentals in Pomona so you can explore the fabulous surrounding countryside on your own. Ontario, California is one of the biggest cities in the San Bernardino Valley. Unlike its Canadian counterpart, Ontario, CA has year-round warm weather, making it a wonderful choice for a winter getaway or a summer trip for a change of scenery. What currency is used in Los Angeles? The U.S. dollar (USD) is used in Los Angeles. What is there to do in Los Angeles? 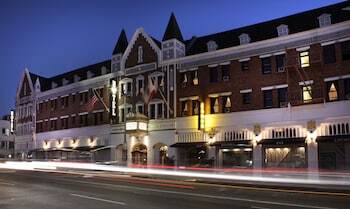 What is the best place to stay in Los Angeles? If you want to be in the thick of the entertainment action, Hollywood is the place to stay. About 6 miles from downtown Los Angeles, you’ll be close to landmarks like the Walk of Fame, Sunset Boulevard and the iconic Hollywood sign. It’s also the perfect place to do some celebrity spotting! If you’re more into surfing or skating, stay in Venice,about 14 miles from the downtown area. With stunning beaches and idyllic ocean views, this region is great for walking or cycling around. Stroll the Venice Beach Boardwalk, take some photos on the famous Santa Monica Pier and then unwind in one of the many restaurants and bars. What is Los Angeles famous for? Experience some movie magic for yourself by visiting Universal Studios Hollywood and the Walk of Fame. Less into glitz and glam and more into nature? 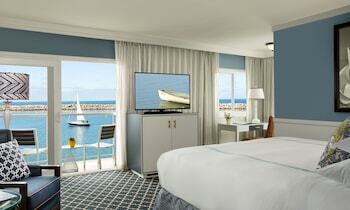 Tour the wide beaches of Santa Monica and Venice or check out Catalina Island. Adventurous types might like to mountain bike along the Trans-Catalina Trail. For more iconic LA experiences, take the kids to Disneyland Park or shop up a storm on Rodeo Drive. 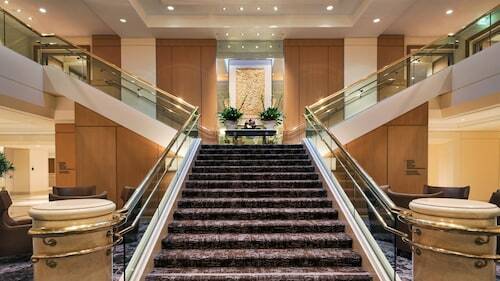 Set in the Hollywood & Highland entertainment complex, Loews Hollywood Hotel is next to TCL Chinese Theater, the Walk of Fame, and the Dolby Theater, venue for the Academy Awards. 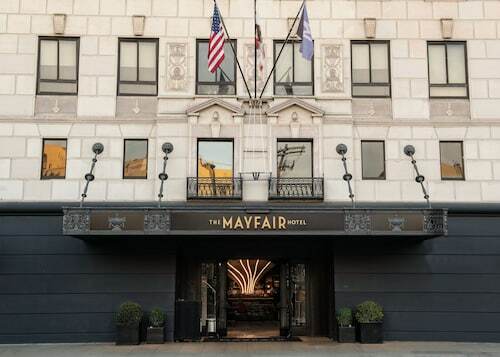 The Mayfair Hotel Los Angeles is centrally located in downtown Los Angeles: only a block away from the Financial District, Civic Center, Jewelry Mart, and Garment District. 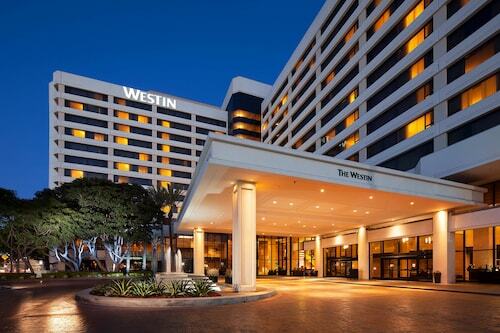 Located a short complimentary shuttle ride from the Los Angeles International Airport, The Westin Los Angeles Airport offers easy access to Fortune 500 companies, upscale shopping, and Venice and Redondo beaches. 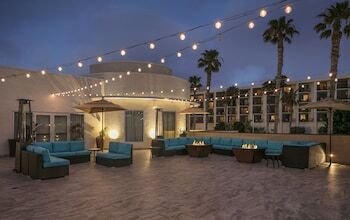 Situated less than a mile from LAX airport, with Manhattan Beach, Venice Beach, and Downtown Los Angeles all nearby, this airport hotel offers easy access to the I-405 freeway.